Located in the Korean province of Chungcheongbuk-do, the Daemyeong resort in Danyang County was the recent destination a group no less than 123 umpires, comprising 28 members who had national qualification alongside 95 participants who had progressed to international level, some also attaining having gained the highest of all, the Blue Badge. 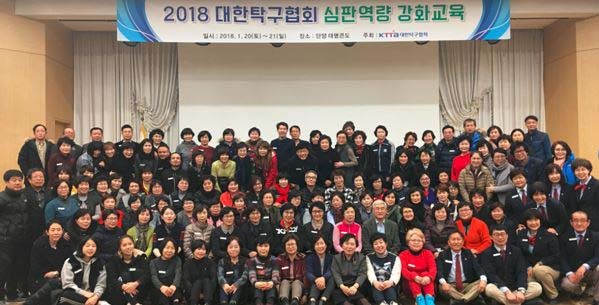 Organised under the auspices of the Korean Table Tennis Association the gathering was held on the weekend of Saturday 20th and Sunday 21st January; proceedings being administered by Jake Choi one of several present who also possessed the International Referees qualification. The aim was to raise the level of officiating by basing the meeting of the major principles established by the Umpires and Referees Committee of the International Table Tennis Federation (ITTF URC). Items on the agenda included: racket control, illegal services, field of play, the calculation of a round-robin results and discussions on difficult problems which may arise in addition to a rules examination. Principle speakers were Ma Young-Sam, the Chair of the ITTF URC, Park In-Sook and Jake Choi. Ma Young-Sam addressed the role of the ITTF Umpires and Referees Committee, Park In-Sook spoke on the topic of field of play presentation; for Jake Choi, the subject was illegal services and rules examination. Umpires and Referees Park In-Sook Ma Young-Sam Jake Choi.